The sound of music: Principal trumpet Karen Donnelly is joined by principal horn Lawrence Vine (left) and principal trombone Donald Renshaw (right) in Iqaluit. Photo by Fred Cattroll. 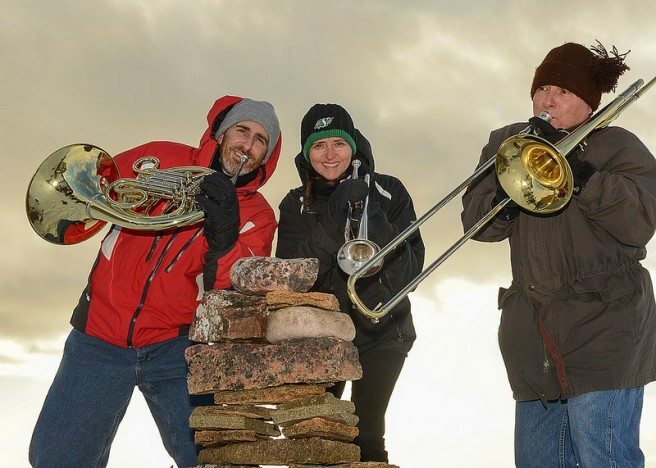 The National Arts Centre Orchestra (NACO) recently embarked on a 10-day tour of Canada’s northern territories. Along with some of the country’s top musicians – including Manitoban violinist James Ehnes and throat singers Evie Mark and Akinisie Sivuarapik – the orchestra will be hosting roughly 50 workshops and six concerts in Iqaluit, Pangnirtung, Rankin Inlet, Yellowknife, and Whitehorse. With a strong focus on education and collaboration, the tour aims to build on relationships established through the NAC’s Music Alive Program: Nunavut. Ottawa Magazine‘s Erica Eades chats with principal trumpet Karen Donnelly about the joy of teaching, life up north, and the key to staying healthy on the road. Through NAC programming you’ve taught in Switzerland, Mexico, the United States, and Canada. Why is this type of outreach important to you? That’s a really exciting part of this job, and it’s what makes working here at the NAC so unique. Not only is it a world-class orchestra, but it also has this other real focus, this passion for education and giving back. Because my background is band – I started playing trumpet in my school band in Regina – I’m very connected to that type of music education. It’s part of my world, my history. It’s something that’s meaningful to me personally, but I also see how exciting it is for the kids. It gives them something to work towards, something to look forward to. What will your role be on tour? I think I’m involved in about half a dozen educational things. Because the trumpet is such a common instrument, I will be doing quite a few workshops with the school kids. It’ll be a mix of small ensemble performances and workshops. But I will be doing some community outreach, too, including a performance in a seniors’ residence in Yellowknife with our brass trio. You traveled to Iqaluit in January to get to know some of the Nunavut partners. What can you tell us about this visit? Oh, it was a whirlwind three days. [The temperature] was minus 49. That’s the only time I’ve worn long johns during a concert. We had to wear ski pants to get to the car, and then from the parking lot to the school. Our concert was during a snowstorm and we were worried no one was going to come, but 300 people showed up! It was really quite special. What do you foresee as being your greatest challenge while on tour? As a trumpet player, I practise quite a bit, and practising a loud instrument in a hotel is not easy. I like going on tour, but I also hate going on tour because of that. I have a mute that allows me to play considerably softer, but it’s not conducive to good sound. Other than that, it’s the same as what anyone would encounter while traveling: strange hotel pillows and restaurants, and just trying to stay healthy. So often everyone gets the “tour cold,” so I usually beef up on my vitamins before we go. What can we do here in the nation’s capital to help sustain this type of collaborative education throughout the year? Just more of what we’re already doing, which is providing resources. Part of our mandate is that it’s not the “Ottawa National Arts Centre,” it’s the “National Arts Centre.” Everyone from across the country – east, west, north, south – should have access to our resources. The NAC Orchestra’s Northern Canada Performance and Education Tour runs until November 4. Track their progress on Twitter @NACOrchCNA (hashtag #nacotour).